The Sun Kosi is a brilliant river - at its best in medium to high flows with big bouncy grade III-IV rapids and lots of friendly holes and waves to surf. 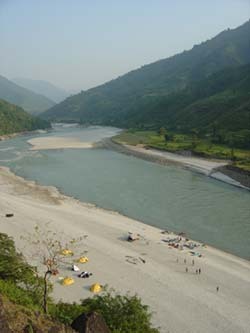 Originating near Mount Shisha Pangma in Tibet, the River of Gold runs eastward through Nepal draining most of the eastern portion of the Himalayas. From the put-in at Dolalghat to the take-out at Chatra in far-eastern Nepal, the warm water of the Sun Kosi surges, snakes and winds its way through 270km of some of Nepal's remotest countryside. At the right flow this river journey is an incredible combination of exhilarating whitewater, beautiful scenery and glorious evenings on white sandy beaches. It is truly breathtaking, and backed by its popularity is considered by many to be one of the world's 10 classic river journeys. After breakfast we jump on the bus and head for the Sun Kosi river. We will put on below the first damn on the river on the section officially classed as the Upper Sun Kosi. This is a lower volume class III+ run and is a good start to the river with little flat water. We will camp the night just after Sukute. The last big rapid of the trip - The Big Dipper. Its then a quiet cruise down the confluence with the Tamur and Arun and the beginning of the Sapta Kosi, or the Seven Rivers. From this point it is a short 2 hours drive then a 55-minute flight back to KTM. Free time for sight-seeing and retail therapy in Kathmandu. After breakfast we take you back to the airport for your return flight home. Price includes: Airport pick-up and drop off, all accommodation, all meals, guides, all transport during trip, internal flight, permits, national park fees (where applicable).